Paleoanthropology is the study of early forms of humans and their primate ancestors. It is similar to paleontology except its focus is documenting and understanding human biological and cultural evolution. Paleoanthropologists do not look for dinosaurs and other early creatures. However, like paleontology, the data for paleoanthropology is found mainly in the fossil record. Before examining this evidence, it is necessary to first learn what fossils are and how they are formed. In addition, it is important to know how paleoanthropologists date fossils and other evidence of the prehistoric past. In order to understand fossils, it is useful to learn how they formed. Taphonomy is the study of the conditions under which plants, animals, and other organisms become altered after death and sometimes preserved as fossils. Research into these matters has shown that fossilization is a rare phenomenon. In order for a fossil to form, the body must not be eaten or destroyed by erosion and other natural forces. Preservation would most likely occur if the organism were buried quickly and deeply. In most environments, soft body parts, such as skin, muscle, fat, and internal organs, deteriorate rapidly and leave no trace. Only very rarely do we find the casts of such tissues. Similarly, the totally soft-bodied creatures, like jellyfish, are very uncommon fossils. Hard body parts, such as dense bones, teeth, and shells, are what most often are preserved. It is likely that the vast majority of fossils will never be found before they are destroyed by erosion. That coupled with the fact that extremely few living things are preserved long enough after death to become fossils makes the large collections of fossils in the museums of the world quite remarkable. It is a testament to the tenacious searching by fossil hunters over the last two centuries. People often think of fossils as being mineralized bones or shells stored in museums. However, they can be any remains or traces of ancient organisms. They even can be footprints, burrows, or casts of bodies with nothing else surviving. Some of the best preserved fossils were rapidly frozen in permafrost soil or ice, dehydrated in dry desert caves, or encased in tree resin that hardened into amber. In any of these three environmental conditions, even soft body parts can be remarkably well preserved indefinitely. Several wooly mammoths that lived during the last ice age have been excavated from frozen tundra soil in Siberia. Some were still in such good condition, that parts of their bodies were fed to the dogs of the Russian scientists who found them. One small mammoth was even transported intact to Moscow where it is kept in a specially made large freezer that allows it to be displayed for the general public. The oldest frozen human remains were discovered on the edge of a glacier in the Alps of northern Italy in 1991. It was a well preserved body of a man, along with his clothes and tools, who died about 5,300 years ago. Even tattoos on his skin were preserved by the extreme cold. The mummies of ancient Egypt were preserved by extreme, continuous dehydration. The complicated mummification practices used to prepare the bodies of important people only accelerated the dehydration, but it was not necessary in the dry conditions of Egypt. Mummies from other cultures have been found in deserts around the globe. Some of the best preserved ones were discovered in the Tarim Basin of Western China. 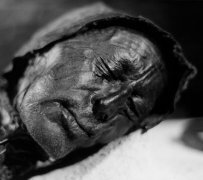 Bodies of people submerged in stagnant swamps or bogs in Denmark and the British Isles thousands of years ago have also been found in remarkably good condition with their soft tissues intact. They were preserved naturally by cold anaerobic environments and by tannins with antibiotic properties released from decaying plants in the swamps. The bodies were essentially tanned like shoe leather. These conditions are hostile for bacteria and other organisms that normally reduce organic matter to basic soil nutrients in a matter of months. 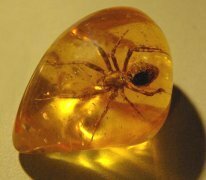 Amber is a fossilized resin that originally oozed from cone bearing trees, such as pines and firs, millions of years ago. When fresh, it primarily consisted of sticky, non-water-soluble organic resins and volatile essential oils. Occasionally the resin fell on small creatures and trapped them. Under the pressure of burial deep underground for long periods of time, the resin was converted into a rock-like substance that is most commonly yellow-orange and translucent. Often well preserved plant fragments and animals can be seen within amber nodules. The oldest animal life found in amber so far are single cell organisms that date back to 220 million years ago. Bones are composed of inorganic minerals and organic molecules (especially proteins and fats). After death, most of the organic components are eventually consumed by bacteria. What remains are brittle, microscopically porous bones. Water percolating down through the soil above dissolves mineral salts, some of which are precipitated out into the porous areas of bone. These minerals are usually calcium carbonate (limestone), silica, or iron compounds. Over time, this process makes bone increasingly more rock-like. Dinosaur and other very ancient animal bones in museums were preserved in this way. They are essentially rock today. In extremely rare circumstances, soft tissue can become mineralized as well. The discovery of a 77 million year old nearly complete duck-billed dinosaur fossil in Montana in 2001 showed this to be the case. Much of its skin and muscle tissues had been preserved by the same mineralization process that preserved its bones. Even the feathers of some species of dinosaurs have been discovered in a mineralized form as well as preserved in amber. How Reliable is the Fossil Record? The fossil record is somewhat like an enormously complex jigsaw puzzle with many pieces still missing. Our interpretation of this record has been biased by differential preservation. Some species are underrepresented or have not yet been found. We are left with a somewhat blurred picture of portions of the past, especially the early past. Despite these realities, we have been able to piece together a remarkable understanding of the evolution of life on our planet. Whether an organism is preserved greatly depends on the local environment in which it died. Plants and animals from humid tropical forests are rarely preserved because they decay rapidly in these regions. Similarly, fossils from mountainous areas rarely survive due to high rates of erosion. Desert creatures generally become fossilized more often due to the preserving arid conditions. Likewise, aquatic organisms are often well preserved if their bodies ended up in deep water where there is little oxygen and life. However, bodies in shallow intertidal zones along coastlines are quickly eaten and the remaining bones are ground into sand particles by tide and wave action. Not all bones from the same animal survive equally well. Lightweight bones with relatively large surface areas deteriorate more quickly and are, therefore, less often fossilized. Small, delicate bones are also more likely to be crushed or carried away from the rest of a skeleton by running water. Human and other primate fossils frequently consist of teeth, bits of dense jaw, skull, leg and arm bone fragments. The more porous ribs and shoulder blades are rarely preserved. There has been a bias in the fossil record resulting from the fact that paleontologists have not equally searched all areas of the globe. Because of the inaccessibility of some regions, such as Central Asia and much of Africa, their fossil records are poorly understood compared to those of Europe and North America. Many in the current generation of professional fossil hunters are now concentrating their efforts in these underrepresented areas. When only one or two skeletons of a species have been discovered, there is no way of knowing how representative they are of that kind of animal. They could be typical or atypical in size and shape. Until many more specimens have been found, it is unwise to attempt a definitive species description. Imagine if our species becomes extinct at some distant time in the future and extraterrestrial fossil hunters visit earth and find only one human skeleton. Just by chance, it could be male or female, young or old, tall or short, normal or deviant. The extraterrestrial scientists would very likely not grasp the full range of what humans are like from this evidence and would develop an inaccurate picture of our species. Early in the 20th century, just such an error was made by the noted French paleontologist, Marcellin Boule , when he analyzed one of the first nearly complete prehistoric human skeletons found in Europe. Boule described this Neandertal specimen from la Chapelle-aux-Saints , France as a dull-witted, brutish, ape-like man who walked hunched over with a shuffling gait. This misled several generations of anthropologists. In fact, the skeleton was abnormal. The individual was a very old, arthritic man with severe, near crippling orthopedic problems. We now know that Neandertals looked much more like us than was earlier believed. Paleoanthropologists today consider them to have been either an early variety of our species, Homo sapiens , or a closely related species. The complexity and size of their brains, along with their cultural artifacts, indicate that they were far from being a dim-witted, ape-like creature. NOTE: In many older books, Neandertal is spelled with a "thal" ending (Neanderthal) instead of "tal". This is the Old German spelling that was replaced in the early 20th century. However, this antiquated usage persists in some English publications. It is also continued in the scientific designation (Homo neanderthalensis). When paleontologists trace the evolution of a species line, they often find that there are gaps of time in the fossil record. Nineteenth century evolutionists referred to these periods in which fossils were still lacking as "missing links" in the "chain of evolution." Such gaps are often the result of changing preservation conditions in the distant past. For long periods of time, most individuals in some species may not have survived long enough after their deaths to become fossils because they were eaten, and the few fossils that were formed may have been destroyed at a high rate by increased erosion in particular regions. Gaps in the fossil record are sometimes due also to the simple fact that we have looked for them in the wrong places. The climate has dramatically changed many times in the past. When that occurred, members of the same species often died out in one region but flourished in others. Unless we are alert to this possibility and search in different geographic regions, it will look like the fossil record has been abruptly broken, only to begin again thousands or even millions of years later. Eventually, the larger gaps in the fossil record are usually filled through intensive worldwide research. This has resulted in an ever more accurate picture of the past. Fossils show us a great deal about earlier life forms. Not only can we learn about evolutionary processes and trends, but we can also reconstruct body shapes. Most prominent animal fossils displayed in museums usually are mineralized bones. From these skeletons, researchers can often learn about gender, physical capabilities, growth patterns, life expectancies, and pathologies. For instance, by studying muscle attachment points on bones, it is usually possible to make inferences about the size and shape of muscles. This can be an important clue to understanding locomotion. The relative size, shape, and position of eyes, nose, and ears on a skull can lead to an understanding of the importance and capabilities of these different senses. In humans, gender can often be determined by noting skeletal differences of the pelvis, or hip region. These differences are due to modifications needed for a broad birth canal in females. Brains are virtually never fossilized, but the brain cases often are. These can give us a good idea of the gross structures of brains and their overall mass. The age at death can be estimated by such things as closure of bone growth plates and skull sutures as well as tooth eruption and wear patterns. Bones sometimes also show evidence of medical abnormalities such as fractures and other injuries as well as specific kinds of diseases such as meningitis and tuberculosis. How are Fossils Assigned a Species Name? When new fossils are discovered, it is not always clear as to which species they belong. There are two different, opposing approaches to solving this problem. They are commonly known as the typological and the populationist viewpoints. Those who take the typological approach believe that if two fossils look even slightly different, they must be from two distinct species. This is an emphasis on minor differences. In contrast, those who use the populationist approach accept that individuals in all populations of organisms normally have at least minor differences. Therefore, when they encounter fossils that are similar, but not identical, they tend to lump them into the same species. They expect that separate species would exhibit major differences. The populationist approach to defining species has become the dominant one in the biological sciences today. For psychological reasons, however, some important discoverers of fossils have tended to take the typological viewpoint. It is ego boosting to say that you have discovered something new and unknown rather than just another specimen of an already well known species. There probably always will be a heated debate regarding the species identification for new fossil specimens. We cannot use the criteria of reproduction to distinguish species from fossils because it is not possible to get two skeletons to breed in order to see if they can produce fertile offspring. Therefore, paleoanthropologists often take a cautious approach and use the term paleospecies instead of species. This is a group of similar fossils whose range of physical variation does not exceed the range of variation of a closely related living species. Eventually, we may be able to define ancient species more reliably on the basis of DNA samples extracted from fossil bones and other preserved tissues. At present, however, this work is just beginning and it is frustratingly hampered by the fact that DNA usually is very fragmentary in mineralized bone. The earliest human whose DNA has been studied was much less than 100,000 years old, while hominin evolution goes back to at least 4,000,000 years.